You can read this article again at the Huffington Post Canada. This Sunday is Mother’s Day, a day we traditionally honour and celebrate the mothers in our lives. Moms, grandmoms, great-grandmothers, step-mothers, adopted moms, surrogate mothers, mothers-to-be: they all get at the very least a nod of appreciation (if not a full-out display of love and affection). So they should, of course. But I have been thinking more and more of the unofficial ‘mothers‘ who never get recognized on Mother’s Day, and I’m talking about the dads. This is not to say that dads are mothers in the truest sense of the word. 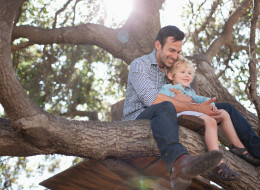 They will always be first and foremost a father — and as such, will always place most importance overall on their interactions with their kids as it concerns their being a father. But for some families, particularly for those who have lost a mother due to death or separation or some other form of difficulty, dads are playing both parental roles to the best of their ability. Let me pause to say that I also recognize women do these very same things (act in dual parental roles), but let me save that blog article for Father’s Day when I recognize mothers. Back to the fathers. These guys are moms to their kids, all while they are still being that incredible father they always were. I can think of one such dad close to our own family’s heart who lives this reality. He is currently dad and mom to his girls (girls who are still needing his love and attention in both a maternal and paternal way), as well as he is doing what his girls’ mom formerly did for them prior to her death. As I watch the various dads I am coming to know and truly appreciate, many of whom have lost wives to cancer, I can’t help but observe the grace with which they have handled the passing on of their spouse. I am amazed and humbled to see that being a mother has been added to their job description. In true motherly-form, they are willing to do what it takes to be there for their kids. What a legacy they leave for their beautiful families. These guys are doing things they never use to do (as per the varied division of labour that occurs in any given family), and they are doing some of the things that Mom only once did. And playing these dual roles, solo; without the benefit of another partner to complement their parenting. Things like being that sole parent there when their kids get home from school. Things like planning birthday parties, attending festival performances and watching shows they aren’t accustomed to watching. Things like attending meetings, appointments and practices without the advantage of tag-teaming with their other parenting counterpart. Things like letting their kids know it is okay to cry — because they do too. Things like arranging work schedules around their children. Things like brushing hair and putting up ponytails. Things like being that soft, warm place their kids can fall when life gets rough — because kids need this sometimes. Are these aspects of parenting solely mom’s domain? Of course they are not. Surely, there are fathers out there who take charge in all these areas at the best of times, freeing up their wives to do other just as important parental tasks. But for those dads who NEVER had to take leadership in some of these areas before (or weren’t quite comfortable assuming this predefined role), this is new territory for them. These are unchartered waters. And the fact that they are doing these new tasks solo is what endears them to me, a mother myself. Rather than being criticized, these dads need to hear the words that they are doing an amazing job at parenting their children — playing the role of both partners in the absence of their female counterparts. On Friday afternoon, I held a Mother’s Day tea in my classroom for all mothers of my current students. And it was a lovely tea for all those who were able to attend. Most of the moms came, along with one grandmother. When we got to the part of the program where I told them I would be reading some answers to questions that students gave me about their mothers, I heard an audible groan go up from the moms. Of course, there was concern about what their child might have said about them, things said which could inevitably bring embarrassment to the given mother (no matter how cute or adorable it might sound when I wrote it down- word-for-word with the intentions of reading it aloud). I assured them, in not so many words, that there was nothing to be said that would make anyone want the floor to open up and swallow them alive. Although some of the answers were pretty cute, along with their amateur use of grammar at this age. Isn’t it interesting how concerning it can be when we know our children have expressed their thoughts about us to someone else. Today, I was standing next to another young mother and she and I laughed about the fact that we are always wondering how our kids can come up with such flattering, complimentary professions of love for us in their cards and notes when what we really wonder is if we’ve scarred them for life with our constant bellowing and nagging. Not to mention our cranky monologues. Yesterday, the day before Mother’s Day no less, I had an absolute meltdown regarding Some Children Of Mine who for three consecutive days in a row have left me “surprises” in the toilet and forgot to send them to the undergods at the septic level. I never intended to blow a blood vessel…it just gradually progressed to that point without any real warning to either me or them. In about five minutes flat, I went from concerned, compassionate caregiver to crazed psychopath. There we are few of us crying and a few of us screaming. And those not doing either of those two things were considering ways in which to prematurely disable their hearing by first blowing a hole in their eardrums. It was not my finest moment as a mother. And I have thought a bit over the last twenty-four hours about my meltdown, along with the fact of the matter that I am still an amateur at this gig, even after fourteen years of practice. I still could use a handy manual or helpful little nanny to step in and intervene on those days where I have just “HAD ENOUGH”. Which leads me to my next level of thinking: that we are not mothers because of what we do, necessarily. But rather- mothers because of who we are. Added to that fact is this little bit of encouragement: we are not expected to be perfect at this mothering gig in order to make an impact. In order to be effective. In order for our children to love us. Because it’s okay to mess up. It’s okay to still be a work in progress. To be a wrecking ball at times. I think there is a bit of truth in both lists, tbh. Because to be honest, moms don’t have to be perfect so as to be the perfect-fit for their kids. They don’t have to be mesmerizing to the exclusion of once in a while being viewed as a meanie. Nor do they have to be either always organized to the point that they don’t consider themselves a wee bit overworked. We are mothers after all. Not saints. We can be tolerant while brutally truthful. Happy while still being honest and true to what we see as the obvious. We can be the enthusiastic cheerleaders our children need us to be, while inside feeling absolutely exhausted and unable to put two coherent thoughts together. The truth is, we don’t have to have our act together- have our ducks always lined up in a row. Mama, we have permission to mess up. We are not perfect. But we are perfectly right for the children we’ve been blessed to love. And that is why they love us anyway. And why we joyfully can carry on in spite of it all. I was reading a blog the other day that gave kudos to teachers, in support of Teacher Appreciation Week. It talked about the work that teachers do and acknowledged teachers and educational assistants as doing important, worthwhile things, in both academic and other areas, so as to support children and young people in their growth, learning and development. It talked a lot about the little unnoticed things that teachers do, things that often fall below the radar as far as visibility. It was a nice article- it made you feel good to read it. Particularly if you were a teacher. And then I scrolled through the comments. And as I did, I came across some negative feedback- as there so often is- to counter the opinions of the author. Comments placed there so as to undermine the author’s attempts at acknowledging her intended audience: teachers. Comments placed there to whine about why other groups of people hadn’t been thanked. Comments placed there to diminish the efforts of individuals committed to their calling and willing to make sacrifices so as to continue doing so. They were rather hurtful comments to read, whether one was a teacher or not. I am a teacher. But these comments didn’t irk me because I am a teacher. They irked me because I am a human being. A person with a desire to continually acknowledge the best in people and thus see and commend the value of other human beings in service, whomever those individuals might be. And I do this, quite often, through the art of appreciation. Which is to say: I try to watch others. And whatever they might be doing or saying or being matters to me. So much so, that I try to extend to them, as often as I can, a word of appreciation. Thanks and gratitude. It’s not rocket science- but it is pretty important stuff: actually, it’s how I was taught to be by my own gracious mother. So I continue to do so as often as I can. And it is what I now teach the next generation to do as well- my students and four children as well. It’s quite easy really. Appreciate people. Tell them once in a while what they mean to you. Carry on and repeat. But I am finding, at times, that this ability of ours as people, to appreciate others: it is passed over in favor of the all-important critique. It is more trendy to critique someone on their performance, abilities or job and less favorable to find the best about them instead. It is more interesting to find fault. Less interesting to build up. More interesting to point fingers rather than to join hands. As a result, we are losing much, not the least of which is a dying art. That is, the art of appreciating people and things and ideas. The ability to recognize possibility. Particularly, the potential in another human being and then acknowledge that same person for their endeavours. I think that we as people can never do enough appreciating in this life. And it certainly should never come at the expense of a lost opportunity taken instead to undermine another human being’s worthy attempts at celebrating other human beings for their efforts. My students had a tea party for their mother’s today. It is my third annual tea party for mothers. I once also threw a pizza party for fathers. It is possibly in the works again for this year. The point of me telling this is because the whole event is organized so that my students can take time to think about and reflect on their parents and the hard work they do at raising them. The important work they do in loving them. And thus come to appreciate them a little more. We spend time thinking about what parents do. How they look after us. How they provide for us. We take time to thank them. We sing songs in praise of them. We prepare things that we know they will like and then we serve them. We let them eat and drink first, for a change. In short, we take time to honor their legacy. It’s very important work- and not just for five and six years olds. It just might be some of the most significant work I do with my students all year. I take it very seriously. What I am trying to say here is this: we need to instill in our children, our young people and thus in adults as well, the value of appreciation. The worth of acknowledgment. The importance of telling people what they mean to us. The art of appreciation. Not because we as receivers of this praise need it so as to shore up our self esteem. Not because we are needy of accolades. Not because we can’t function unless we have a set number of compliments. But for our souls. Because quite simply, we matter. No matter what we do we matter. That’s because people matter. And because our person matters: our contributions thus matter, our influence matters and our legacy matters. And when we are told as much, it causes us to want to do the same for another human being, starting a chain of appreciation to begin to form. One can only imagine what ways this world could change with such a chain. Such a possibility for seeing worth in the world around us. It is quite simply the power that is the art of appreciation. And I believe that when we appreciate, there is no end to the possibilities for hope. Post-Mother’s Day 2013 (survived!). And so here I am reflecting now, on a few of my favorite things. Mothers and holidays and good old-fashioned truth-telling. Blog style. And I got to thinking about motherhood. About the mothers I know and love, and about how each special mother, from those who are steady and patient to those who are more boisterous and bold: each Mama I know is to her own self, true. True to her calling. True to herself. True to the mama she is and was meant to be. And truth matters. Because it is reveals who we really are. I was confused today by a writer claiming to be truth-teller. A beautiful mama whose blog writing I follow. And what confused me was this. She has always been characterized by certain behaviors and traits- which she has carefully revealed to her reading audience through selective choice. She staged it to be this way. And then, out from nowhere, came something completely opposite of what she had built herself to be. Nothing bad, nothing harmful. Just confusing. And in and of itself, what was presented was perfectly acceptable behaviour for another woman’s style of mothering. But because it was HER writing, it was confusing. Because I always thought she wanted me, the reader, to see her in a certain light. And now she was completely changing the rules. And so, upon reflection, I have decided to highlight the many faces of authentic mothering that I have known. And admire each for remaining true to whomever they believe they should be. As a mother. There are some mothers in my friendship circle who have always known they wanted to be a mother. From their earliest memories of being themselves a child, they knew in their heart they would one day love a child of their very own. These mothers are natural nurturers. From a little girl, they could find in a crowd that one person who needed a little extra love and attention. And they could make that person feel accepted and included. They were natural empathizers, knowing just what to say and what to do to make those around them feel loved and cherished. These mamas are often put on a pedestal. But really, they are just doing what comes naturally and easy to them. They appear effortless in their mothering. And it looks easy because it is: when you love something, it isn’t work. It’s a joy. There are other mothers whom I have known, who have grown into mothering. It was a learning process. They always wanted children but just weren’t quite sure what to do with the lil’ creatures when they arrived. “You have to do WHAT with these baby wipes, and WHEN…?” I can hear them incredulously muttering to their Hubbies. And that, having been said during pre-natal classes only after having been stunned into reality from the grueling labour and delivery video. These moms, love their hearts!, did their best to muddle their way through in the dark. Finding their niche with every passing year. Getting their groove back with every passing milestone. And doing a bang-up job at this gig we call mothering in spite of their lack of experience. There are some moms who were surprised with becoming a mother. Perhaps it was the timing that threw them off-guard. Perhaps the circumstances. Perhaps it was a combination of the two. And some of these moms, if they were to be brutally honest, would say they don’t love the act of mothering. And that becoming a mother isn’t all it’s cracked up to be. But these moms, they love their children. And they are committed to seeing their children through childhood into their adult years. Committed to giving their offspring what they have- out of a heart of sacrifice and a heart of devotion. They are warrior mamas. They are soldiers. And these Mamas are giving out of a heart of love as much as are those whom we might hold to a idealized stereotype. It just feels a little different. And that’s okay. Some Moms are reckless. They love to live life on the edge. They live life large and loud and free. Others are quiet and introverted. Blink, and you might miss them in a crowd. Some mothers love to do crafts. They are the reason we have Pinterest. Others hate the darn things (their motto: crafts=pinsanity). Some moms are amazing cooks. Some can’t even boil water. Some mothers love to be alone, away from the prying hands of little children. Other mothers long for hands held close and warm embraces. Moms come in every shape and size, in every color and variety. And you couldn’t find the same prototype twice. They come custom-designed. Some mothers, to the naked eye, just seem perfect. And when you size yourself up next to them, you feel you can never add up to as much. They just know how to ‘mother’ with such ease and grace. They are models of what the stereotypical mother might be, were she truly a reality. And they give other mothers a source of inspiration and motivation of purpose. Other moms seem to care less about perfection. They would rather you and the rest of the world, know as much. Because they love being the black sheep of the mothering crowd. They thrive on being ‘good-enough’. Anything more would be a little too much cotton candy for their liking, thank you very much. But these moms- they still show up for their kids, in spite of the image they often portray. And they are much better than their “good enough’ projection seems to indicate. Excluding my own mother, and trying my best to be impartial! I have to say. Amongst the circle of mother-friends and acquaintances whom I know and love, there is not one mother I can say is the perfect prototype. Not one I would hold up to the light and declare, “This one! She is the true ideal!” And neither would I want to. Because every mother is best in her own right. Every mother is perfectly suited to the mothering she was designed to do. Because mothering is an art. It is not an ideal. It is a calling, not a job. It is a life-long pursuit, not a milestone marker. And it is mostly an act of the heart and the soul, not so much an act of physical reflex. And all of us who call ourselves mothers need not compare ourselves to one another. Because it is the variety that provides beauty and color. And if not for the wide array of mothering prototypes, our children would not have the custom-designed Mama that was specifically chosen for them. The travesty lies in trying to be someone we are not. In believing we are not good enough. In thinking we need to be more like one type of mama and less like another. It is in our diversity that we find excellence in design. In our weaknesses, we find we are made whole. And each Mama must be the mother she was called to be. For that is being a mother at one’s very best. That is being authentic. That is being true. To each one, be true. To each mother: be true. True to yourself. To your family. True to your world. True to your Maker. And true to the mother you were designed to be. It is only in embracing who we truly are that we can then accept others for who they were designed to be as well. And a mother does it right, most of the time, when she is authentically herself (allowing for a few mishaps here and there!). She does it right when she is true. That is, when she is truly the kind of mother she was meant to be. Another Mother’s Day come and gone. Let me hear a whoop-whoop from the peanut gallery. Ah, Mother’s Day! A day of great expectations and high aspirations. Look it. Here’s my unbiased advice for surviving the day. Let’s just all take a b-iiii-gggg breath. And then, let us exhale in unison. Now. Let us release all those fuzzy, pink thoughts about obedient, compliant children and doting, adoring husbands and allow them to go flying out of our heads. Off to Never-Neverland where they belong. Because let’s face it: Mother’s Day is every day of the year. And the days to follow Mother’s Day Sunday are not really unlike the rest. However, if you are one so inclined to keeping with Mother’s Day celebrations, I believe mothers should truly cut themselves some slack- and lower the bar. Lower the bar, baby! That way, if your children remember it is Mother’s Day and they make you a card, it will truly be a surprise. And if your Hubbie gets you a breakfast sandwich from Tim’s, it will come as a complete shock. And if you get a dandylion, chapstick, flowers, chocolates, a sweater or a new Corvette: you will truly be blown away from the shock and wonder of it all. Train yourself to expect little, and when great things happen (i.e. the children get along for the half-hour it takes to eat lunch), you will be pleasantly surprised. It will come as an utter delight to your weary soul!! Anyway. I believe Mother’s Day should come as a complete surprise to us mothers. We should never, ever know when it is coming. Mothers always like to know things ahead. And sadly, that gives us more time to ponder, ruminate, reflect and worry. Wonder. Speculate. Plan and organize. No mother should EVER have to plan and organize her own day. So…Mother’s Day should come on a day when we least expect it…like April Fool’s Day. Or the middle of January, when we are all depressed about our friends and colleagues heading south. While we remain behind, vegetating in our freezing cold houses. Mother’s Day is nice, don’t get me wrong. I just don’t want it to be the ‘be-all and end-all’ of my year as a mom. When I say every day is Mother’s Day, what I really mean is this: if your kid gives you an unexpected hug mid-March, save that one as a Mother’s Day memory. If your Hubby takes you and the kids out for supper in late-June, after arriving home from work to find you asleep on the kitchen floor mid-supper preparations, tuck that memory away for Mother’s Day. If ANY of your children buy you a Christmas gift with their own money: Mother’s Day. Cha-ching! Voila! Every day is then Mother’s Day! And when you are feeling down and depressed about your miserable existence and lack of attention from the adoring fans we call our children, you can turn your attention to the time, three months ago, when they got it right! And Mother’s Day can be a carry over from day-to-day, to infinity and beyond! And if you do not agree, that’s okay too. I hope you still had a wonderful day as a mother yesterday anyway. I, meanwhile, am enjoying a few moments to myself here on Mother’s Day # 2, May 13, 2013…. I wake up before 6:00 a.m. to a child stealing my pillow and a husband snoring. Happy Mother’s Day, 2012. I crawl out of bed to ready for the day of festivities…birthday present openings and birthday breakfast for the ten-year old, phone calls, church, dinner out, visits with family, church again, lesson planning for tomorrow, various other odds and ends…phew. It is only sunrise, and the day stretches out before me like a rubber band, ready to snap under the slightest pressure. We start the day off with one child emotionally put-out that we did not include him on morning still-in-bed birthday song singing, as is our custom here at the Gard household. We are already negotiating and making deals, and the sun is just coming up over the horizon. Upon quickly smoothing things out, our happy troop heads downstairs to open gifts with the Birthday Girl. As soon as the gifts are opened, Little One immediately tries to steal and manhandle the biggest of the gifts, while the rest of the family watches with awe her ability to so easily get her own way. Man-i-pu-la-tor. And we will see more where this came from before darkness brings another day to a close. Mark. My.Words. Or my name’s not Lori Gard. We schedule in time slots with ‘the gift’, and again, a near blow-out is avoided. We’ll save that glorious event for breakfast. While I am in the shower, Husband slips out to Tim Horton’s to pick up three breakfast sandwiches, two coffees and a box of Timbits. Being that only three of us like egg on a biscuit, you would think that three little inoffensive sandwiches would go unnoticed. But no. The three sandwiches become the center of an all-out brawl. While some are vying for the sandwich, others are fighting for those same children’s right NOT to get a bite. We have one that leaves the table for the entire breakfast, and another that gets a stern talking to. I divide my sandwich in half. After breakfast, we manage to get ready for church in record time and arrive for the first time all year before the service has begun. This, in itself, is a Mother’s Day gift for the record books. We settle in for a busy morning at church, and after things finish up for the morning, our entire family heads off to the busiest little restaurant in West Prince- the Chinese restaurant. Things start off with a bit of a bang as our own family comes in last, and thus Hubby and I are secluded to the end of the table with the ten grandchildren and no other grown-ups. We can hear adult conversation off in the distance, as the table is by necessity a mile long so as to fit the various Gard family members that must eat around it. And we can see adults. But we cannot converse. I stare at an Oriental picture on the wall in hopes of getting inspiration, and it does come. In the form of nature’s calling. I head off to the restroom hoping to clear my head and avoid the confusion of our dining arrangements in the process. As I near a completion of my visit to the Ladies Room, I go to grab some toilet paper from the dispenser, and the whole rig comes off the wall and lands on my head. I am still without paper, so I secure the unit, and try again. The machine falls once more and lands again on my head. So, while I prop it up with my injured head, I manage to secure the paper needed to finish the job, all the while nervously looking under the next stall to make sure there are no recognizable shoes on that side. Lucky for me, I was flying solo. This day is going from crazy to insane. I wrap things up, and get out of there, again in record time. If anything, Mother’s Day 2012 has been about setting new personal bests in the area of speediness. For that, I can give myself a big pat on the back. And so it goes. Or so it went, rather. For now I am staring at a computer monitor trying to think happy thoughts about Mother’s Day and how much it means to all us poor mamas out there just trying to survive the madness. It is definitely a “extraordinary” day. That’s for sure. So as Mother’s Day nears a close, I don’t know about all you other mamas, but it is rather a relief for this one. So many expectations and so much pressure. Not sure I can handle more than one day of special treatment for mothers per year…it might just do me in. But whether I like it or not, next Sunday is a-comin’, and it is bound to be a doozy. It’s my birthday, and I can only imagine what craziness, insanity and downright funniness might arise. One can only imagine. I’ll keep you posted.